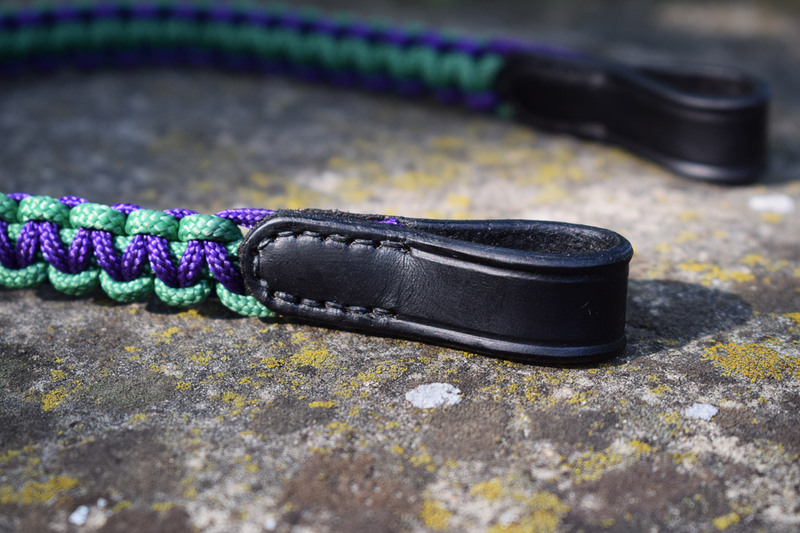 Biothane Beta reins with Super Grip, made in black with green stitchings and stainless steel buckles. Conway buckles at the bit, standard buckle with steel loop at the middle point. Super Grip parts are great for having a solid grip under every weather. Biothane reins can be washed with water and are vegan compliant. Many colors and models available on request. Please contact me for more information about prices and ordering. 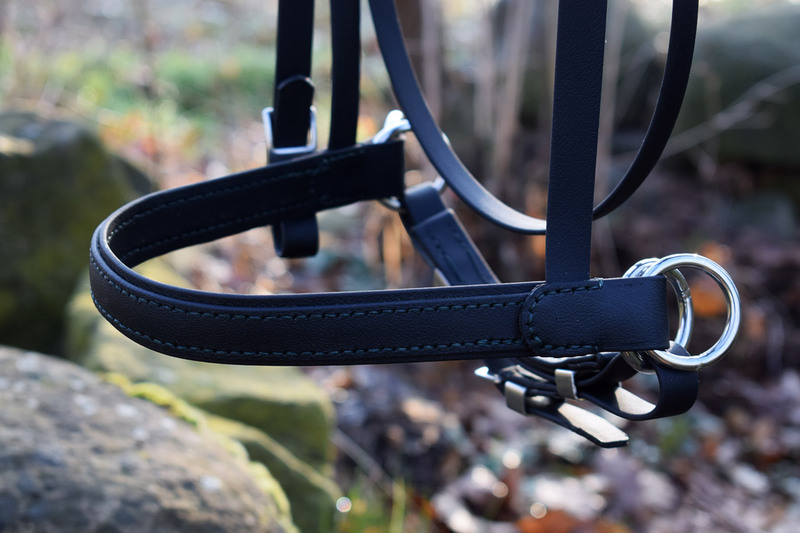 Bridle with swedish cavesson and sidepull rings attachments made in black Beta Biothane with green accents, custom made and made on measure. 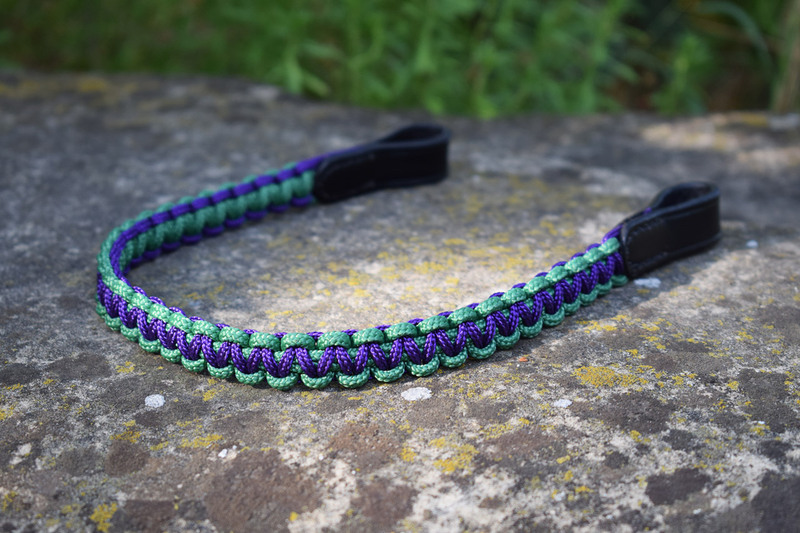 Many colors and custom options available. Please contact me for more info about this custom product. 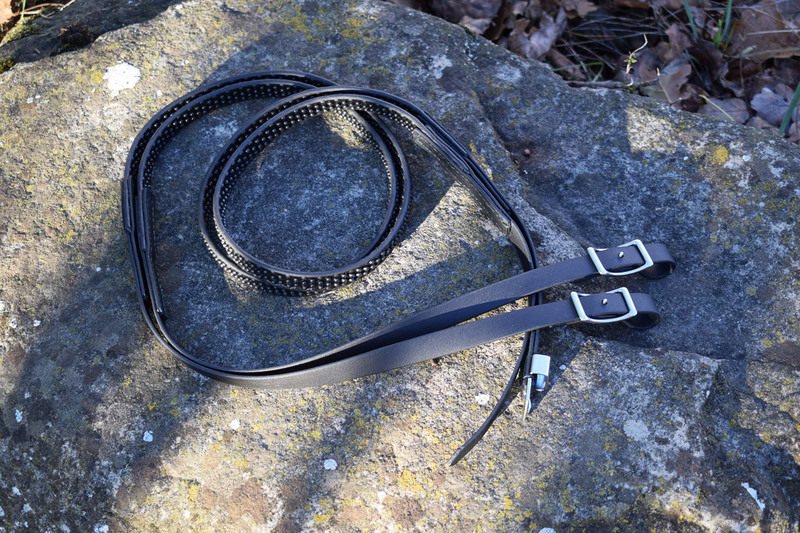 Rolled leather training leash adjustable to 4 different lengths, ranging from 240 cm to 130 cm. 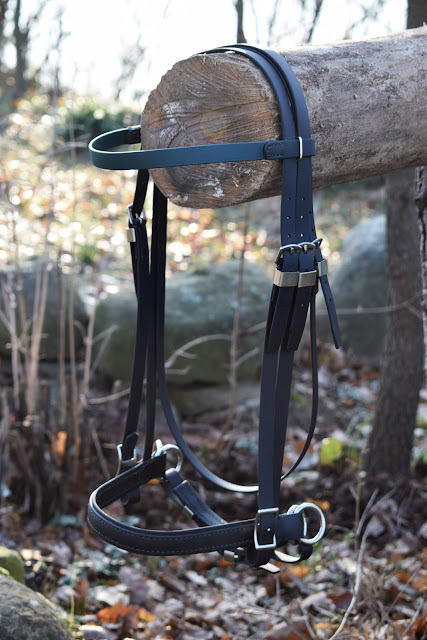 Made in 1" wide bridle leather and hand stitched, it mounts two tough stainless steel snap-hooks. Suitable for large size dogs. Available in 8 different colors and with solid brass snap-hooks as option. This and my other items can be bought in my Etsy shop. Please contact me if you need more information. Laced leather collar made on measure for a size M dog (beagle), in black leather with London tan lacing and lining. 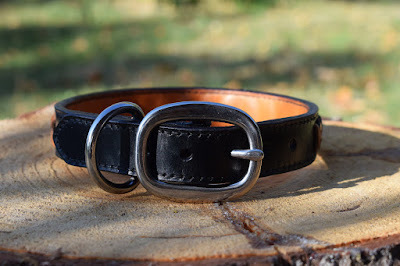 1" stainless steel oval buckle, 5 adjustment holes spaced 3/4". 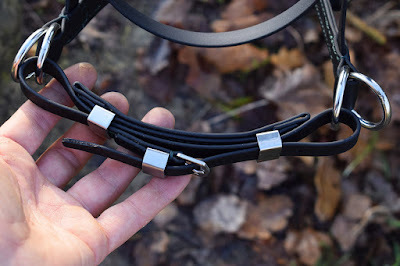 The inside is fully lined so the back of the lacing is not put in direct contact with the dog's mane. This collar is suitable also for dogs with delicate coat. I can make the lacing in one of the 8 base colors: black, dark havana, burgundy, conker, hazel, London tan, red and blue. This means 64 possible color combinations. Also, the lacing can be made in several variants, including different symbols (<, >, X, +, /, \, etc.). Many buckle models available, both in stainless steel and solid brass. I can make this laced leather collar in size M, L and S only above lengths of 35 cm at middle adjustment hole. Ready to ship in 5 working days, shipping worldwide with registered mail. 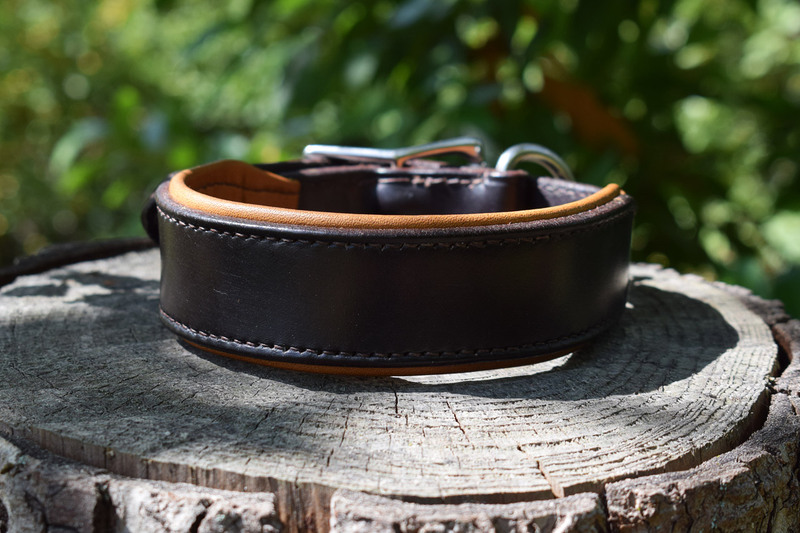 You can purchase this collar on my Etsy shop following this link..
Padded collar for size M dogs, made in dark havana leather with London tan padding and stainless steel buckle. The buckle is 1" wide, while the padded part measures 1" 3/8. 5 adjustment holes spaced 3/4". Made on measure and hand stitched in Italy. 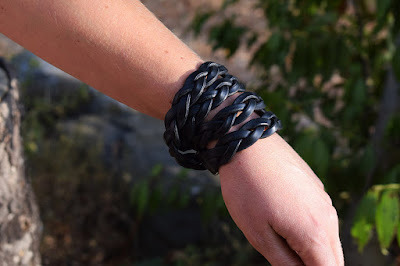 I can make this model in any size from S to L. 8 leather colors and 10 padding colors available. Several buckles available both in stainless steel and solid brass. You can order this collar in my Etsy shop, at this link. I can make and ship it in about one week. 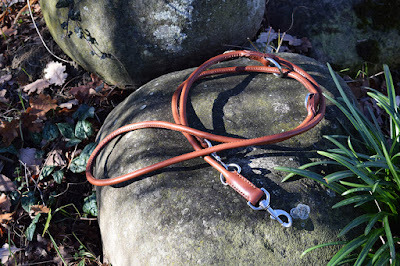 In my Etsy shop it's also possible to buy a matching leash, made using the same leather. 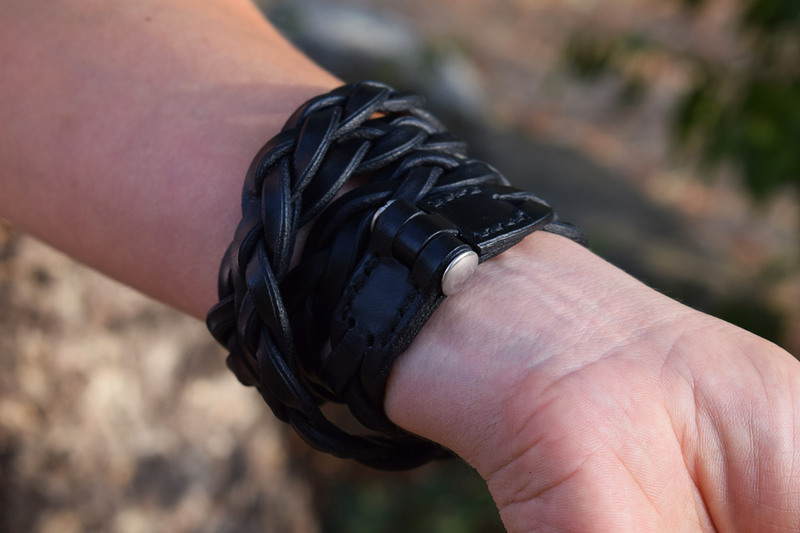 Here is a 4 turns braided leather bracelet, made starting from a 3/4" wide leather strip and my usual stainless steel Chicago screw clasp. This method allows to make the bracelet using a single strip. 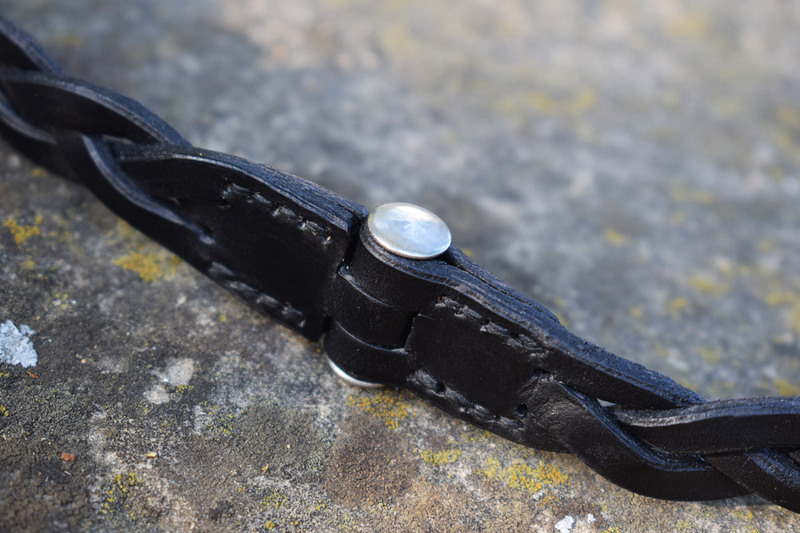 This reduces the thickness of both ends, making the bracelet more flexible thus wearable. 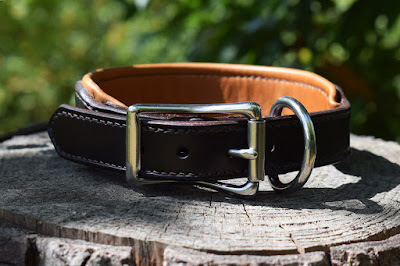 The leather I used is vegetable tanned shoulder 2,5 mm thick. This, combined with the braided structure, also makes the bracelet very pliable. The bracelet is made on measure. I can make it in these leather colors: black, dark havana and London tan. You can find more information about purchasing this bracelet following this link. 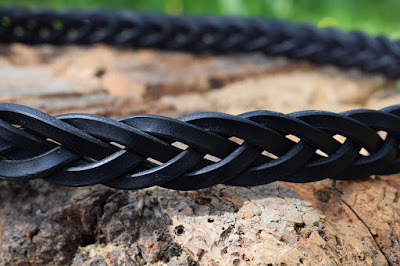 2- colors braided browband made for cob sized bridles. Side loops are made in black leather, I used forest green (border) and purple (zig-zag) rope. 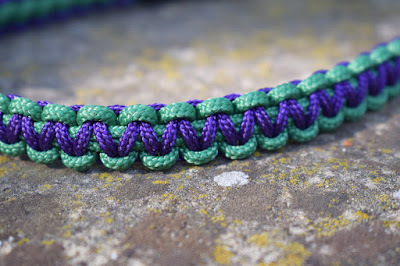 It's reversable: on the opposite face you can find the same braid with inverted colors. It can be made for any horse size, from mini to drafter, combining 18 rope colors and 8 leather colors: that means over 300 variations only for the rope! Handmade and stitched by hand. You can purchase it here (my Etsy shop). 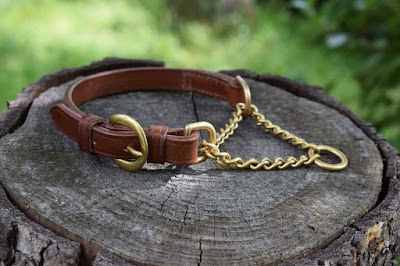 Martingale collar made for a dachshund featuring a brass martingale. I have used 5/8" wide conker leather and a halfmoon buckle. It has 3 adjustment holes. 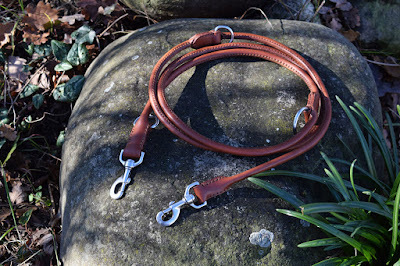 I can make this collar in any size from S to L. The martingale is available both in stainless steel and solid brass, several buckles available for both options. 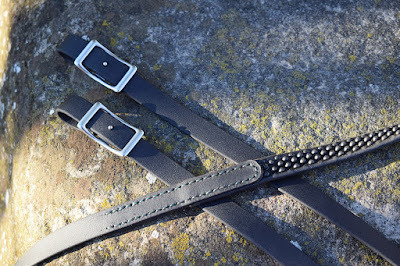 8 leather colors available at the moment. 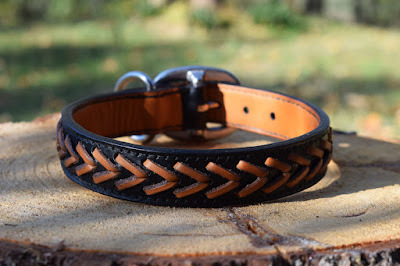 Contact me if you're interested: I can make a custom one for you and your dog in about a week from order confirmation. 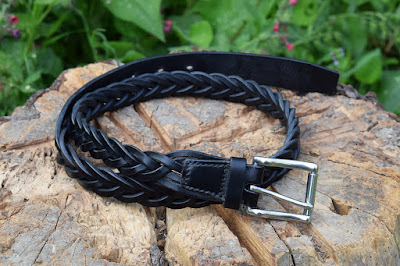 Mens braided leather belt custom made in black leather with 32 mm stainless steel buckle. 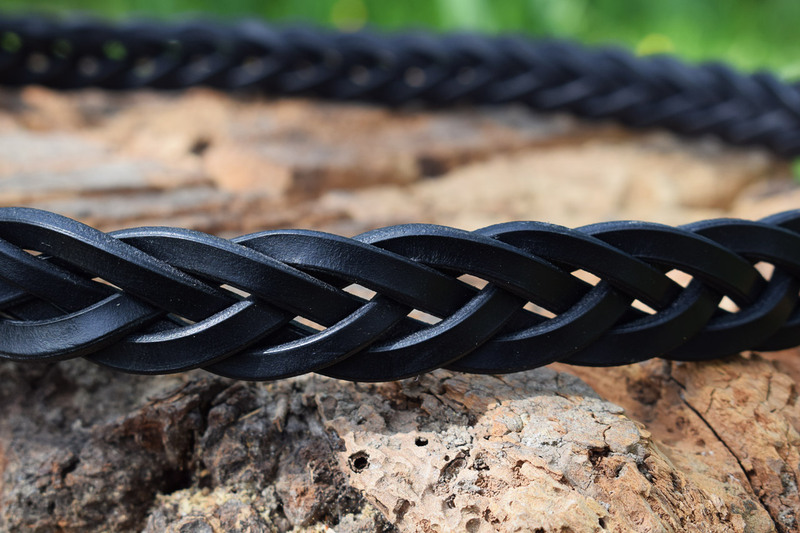 This 5 thongs flat braid is great for leather belts: it makes the belt more flexible and stretchy, improving its wearabilty and adding comfort. 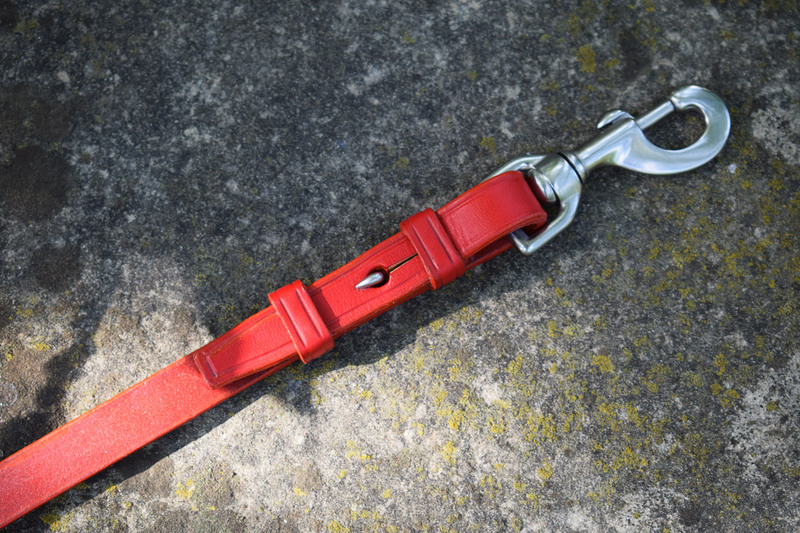 The stainless steel buckle is nickel-free, so it can be worn also by people allergic to nickel. I can make this leather belt in 8 different colors: black, dark havana, burgundy, conker, hazel, London tan, red and blue. I will ship it within one week from order confirmation. You can find more information about purchasing options following this link. 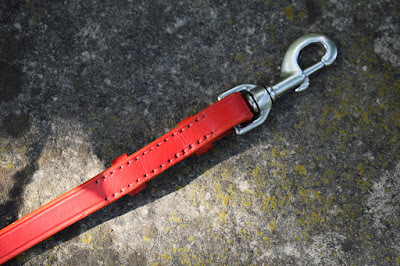 Dog leash made in red leather, suitable for medium and large size dogs. It measures 150 cm and it's 16 mm wide (5/8"). 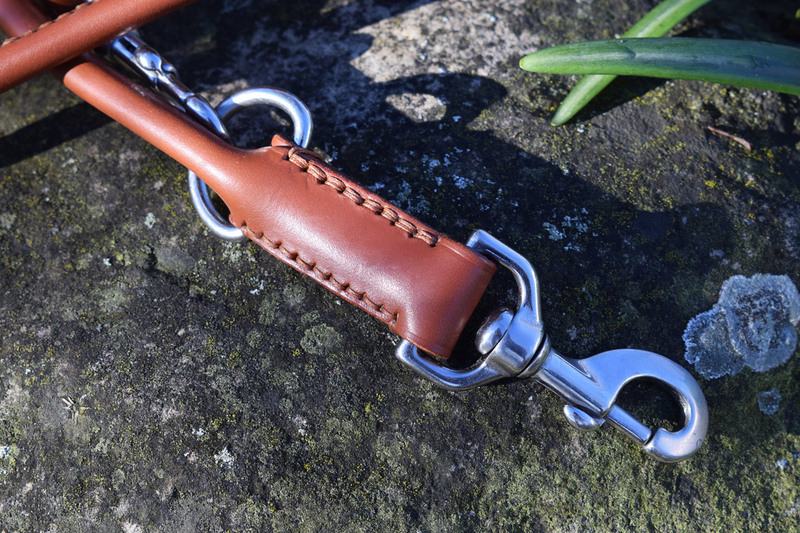 It mounts a sturdy stainless steel snap-hook and a ring trapped in the handle. 8 leather colors available: black*, dark havana*, burgundy, conker*, hazel*, London tan*, red and blue. 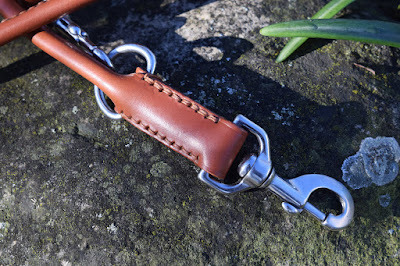 Also, several models of snap-hooks can be mounted: I have several models both in stainless steel and solid brass. I can make this dog leash in lengths from 90 cm to 150 cm (for the colors with the * maximum length is 180 cm). 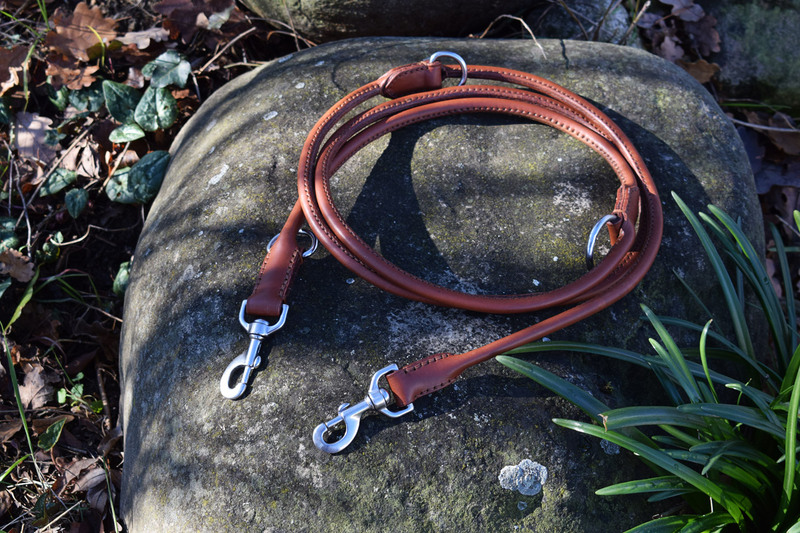 This leash can be done with leather 12, 16 and 19 mm wide, for small up to big size dogs. 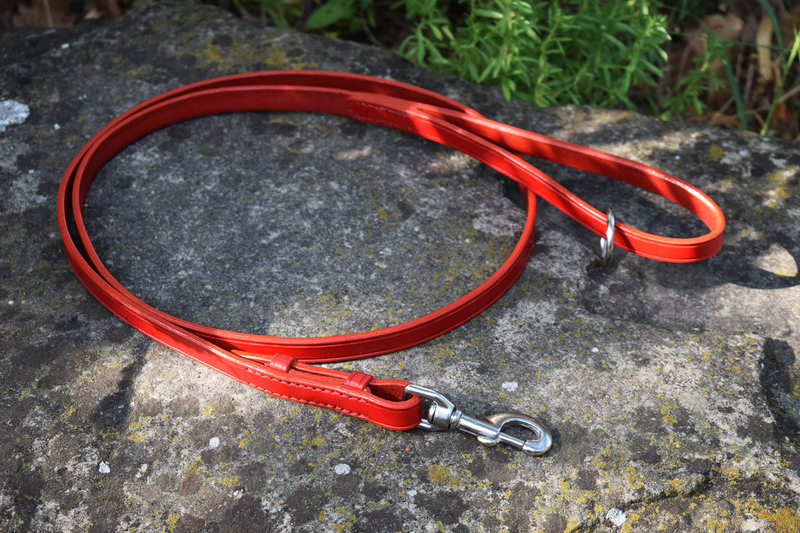 Please check this link for more information about purchasing this dog leash, prices and shipping time.